There are lot of shortcut keys in Microsoft Word just we need to know and use in right place. As we all knows working with keyboard shortcut keys save time and make us professional. 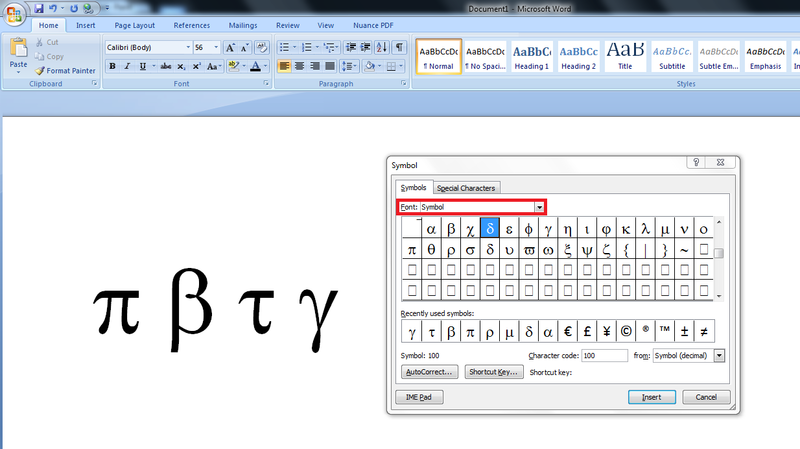 So today's topic is how to insert or type symbol in Microsoft Word by using keyboard shortcut keys, many people don't know how to use shortcut key to insert symbol in word document when they are typing mathematical symbol, if you use mouse its take lot of time and you need to search each and every symbol every time when you need to insert symbol. Follow these steps to work fast and try to use keyboard shortcut keys for mathematical symbols. 1. 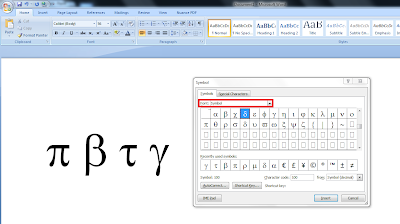 Hold "Alt" key and press "I,S" (Alt+I,S), the symbol box will appear in your word document. If there is any other font in font box, select "symbol" in drop down list, this is one type selection you don't need to do this again. After you select symbol in font box, close this box. 2. Press Alt+I,S to go in symbol and press first spell of symbol name (for example p for pi, b for beta, d for delta, g for gamma etc.....) and press "enter" two times.